It's time to flower in this floral centerpiece. 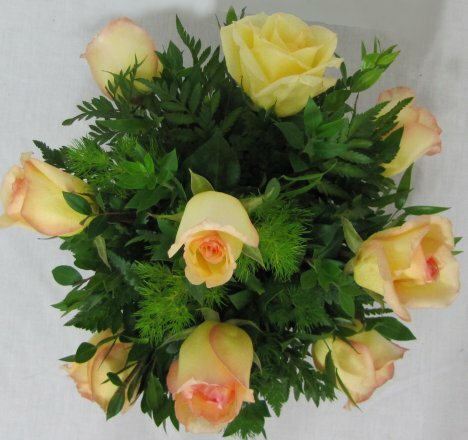 I'm starting with my focal flowers - these lovely yellow roses. Notice how I gave this a little height . . . but kept it low enough so that the guests seated at the table can still see each other's faces. As I insert more roses, you'll notice the the head of the flowers begin angling outward. This makes it so that the flower design is lovely from all sides. 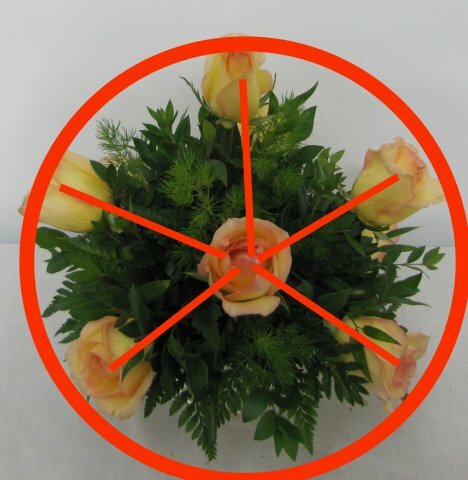 I want a rounded bouquets, so I'm keeping the length and space of each rose insertion fairly uniform. This view is straight down from the top. You can see there is plenty of room for the rest of my flowers. 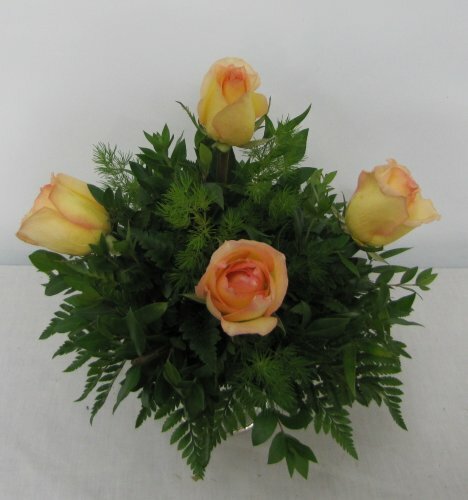 As the roses get closer to the bottom of the arrangement, you can begin to angle the heads of the roses, turning them downward slightly. Try to think of a flowering bush and the natural droop of flowers as they get closer to the ground. I wanted to give you more of a visual from the top view of how the roses are spaced in the design. Don't worry about being too perfect - just estimate it and stick the flower in! However - it's always best to try to have only one insertion. 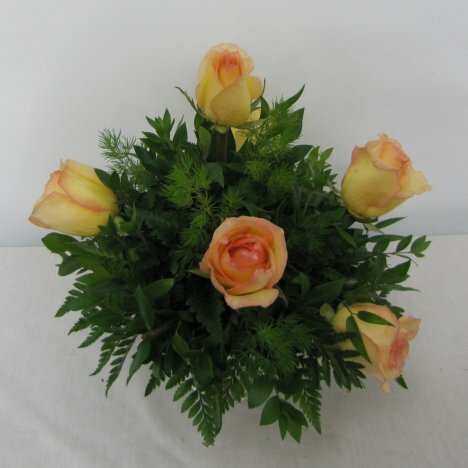 If you keep pushing flowers in and out, trying to decide where you want to place them, you can begin to degrade your foam. Now you can see from a side view how the roses are spaced. 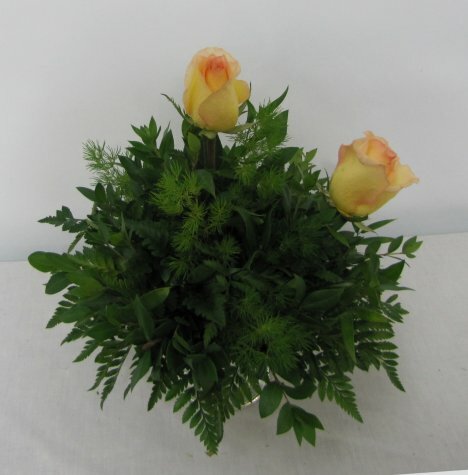 Keep turning your arrangement around and then giving it a good look from the top down. 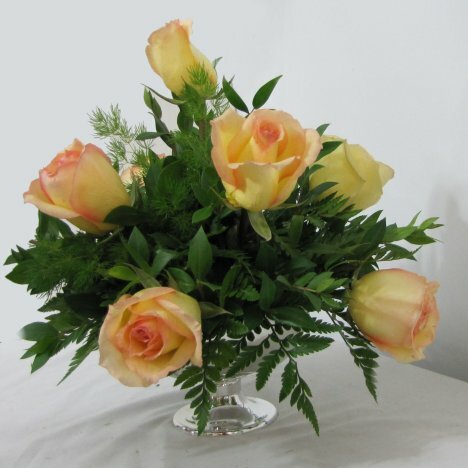 You want all sides to look good, otherwise you may end up with a one-sided arrangement! As we move on to the next step, this is going to be a lot of fun! 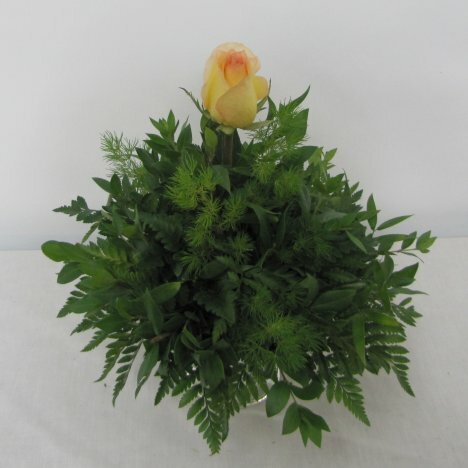 I want this floral centerpiece to pop with bright color, so I'm going to put contrast the the yellow roses with a bright lime green of a button pomp. Keep in mind however, that in no way are you tied into these colors. The mood of this piece can be change instantly if you add soft pinks and lavenders, perhaps with cool blue roses for contrast. Keep in mind, however, that flower colors are not like a box of crayons. 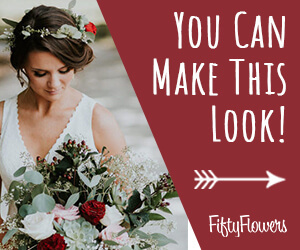 Brides who try to match their attendant's gowns with the same exact color in their flowers may be disappointed in the shade of the real flowers. It's better to compliment your wedding colors instead of trying to match exactly.